When I embarked upon sommellerie four years ago, I had a vague notion about getting people to drink cool wines in cool spaces In Buenos Aires. The very first event was at Aslı Pelit’s apartment in an old cotton factory. Then Cory Sterling and I got people drinking vinos at a veggie restaurant (!) every month or when we remembered. But once his girlfriend Eugenia Villar qualified as a beverages specialist, I sacked Cory and we lady somms got serious. 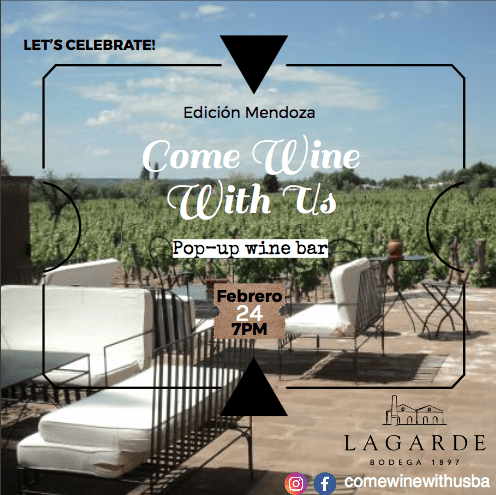 In 2016, Come Wine With Us popped up at Tirso Club – until it just got too big. And now, the dream has come true. Next Friday me ‘n Euge are freaking popping up in MENDOZA. We run a pop-up wine bar. And we love it. See you at Bodega Lagarde, 7pm, 24/2/17!